It’s been just over a week since I said farewell to Dr Wen Wen, our visiting maker/researcher from Shenzhen, along with her fellow makers who had been resident at other UK hosts throughout March. Our residency was a partnership between Lighthouse and the University of Brighton. We wanted to use the opportunity to better understand the networks of making that exist in Shenzhen and here in Brighton, and look for ways that to bridge those networks. Our aim was to introduce Wen to the people, places and organisations that together form the network of making in Brighton. These meetings and site visits would also be opportunities for us to discuss what we experienced, and collaboratively build each others’ understanding. We wanted to bring the scene to life, so Wen could come away with a feel for the place, as well as the facts. We wanted to involve Brighton makers in the process, so that Wen could learn from them, but also so that they could learn from her, and suggest ideas for future collaboration. 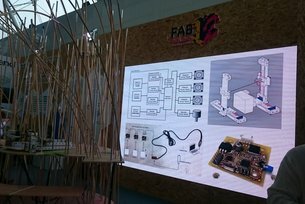 And we also wanted to tie the residency to the opening of the new Fablab at University of Brighton; as a way of starting the community outreach for the lab in a conversational, inclusive manner. While our plan was quite simple, the three weeks hurtled by at an alarming rate. I was hoarse from talking, I set step-count records on my phone from all the visits, and we exhausted the office supply of post-its and sharpies. There’s a full record of our visits on the Lighthouse blog. They included community-run makerspaces, sites of small-scale manufacturing (of everything from bread to bikes), maker education initiatives, universities, business incubators and more. We also used network mapping as a simple tool to make the network visible, trying to visualise the types of organisations, their relationships, their connectedness and how they were clustered. We weren’t trying to create maps as an output, rather using them as artefacts to prompt questions and further exploration. While the exchange was not symmetrical, we were able to use the exploration Brighton as reference for a conversation about the scene in Shenzhen. For example, as I showed Wen a typical makerspace here, she was able to draw out the contrasts with makerspaces there. It was no surprise that many of my assumptions about Chinese making culture and the Shenzhen ecosystem were wrong – that was my reason to take part in the programme. But I didn’t know where the surprises were going to come from. There’s an active discussion within the maker community in the UK about where to place the boundaries of maker culture. Who is a maker; who do we exclude; whose way of life do we appropriate when we apply that term? Before we started, I had, in my mind, drawn a line around the kinds of people I thought were relevant for this project – in part to make it an approachable challenge. I knew this was somewhat arbitrary, and of course, in poking at the edges, it was an impossible boundary to defend. For example, if you include the woodworker, do you also include the timber merchant? What about the DIY superstore? Another example: the Fablab has a strong arts focus, and Lighthouse is itself primarily an arts organisation with roots in film and media. Many makers consider themselves artists, but it seems that networks around art practice might be considered out of our scope. Many of the visiting Chinese makers came from a product design background, or were running electronics or IoT product businesses. This was a stark contrast to even the most commercial of the makers we met. We all call ourselves ‘makers’, but that term can mean many things. The term ‘makerspace’ is even more slippery. I was one of the researchers on Nesta’s 2015 mapping of UK makerspaces, and we were able to draw out some characteristics along which they could be defined: inward – outward-facing, prototyping – tinkering, independent – codependent, and so on. The official name for makerspaces in China is ‘zhongchuang kongjian’, literally, ‘group innovation space’. In the UK, we think of makerspaces as being largely an emergent phenomenon from grassroots activity. I’m sure there are community-led makerspaces in China, but so far, my understanding is that they are mostly arranged around functions (within the space, and in their relations to the network) that help bring products to market. This isn’t about the meaning of words. We’re interested in how makers from UK spaces might work with their Chinese counterparts, or make use of that ecosystem, but it’s clear that there are many cultural differences that we need to take account of in order to find fruitful areas for – and methods of – collaboration. Reading back on others’ experience of Shenzhen through the Living Research programme, and talking to UK makers who’ve been over there, I recognise much of my learning in what they report too. The role of government and policy, the electronics markets, the shift in strategy from OEM to ODM and beyond, the narrative of shanzai innovation, the muddy waters of IP and ‘just-in time’ manufacturing. And I see many of the same opportunities that get us excited about exchange and collaboration with Shenzhen: access to their design expertise, manufacturing and supply chain; the amazing people; a global network of makers learning from and sharing with each other; rapid innovation in important areas like sustainability, health and education. There is a generalised challenge when small and large organisations try to work with each other. For example, the smaller partner may not understand the kind of scale needed to make something work. The larger partner may enforce structures for engagement that don’t respect the constraints small organisations or one-person startups work under: the cost of travel or childcare; the asymmetry of the free reveal (PDF), and so on. More specifically, when we talk about the opportunity for innovation between the UK and Shenzhen, we’re often looking at these kinds of ‘little and large’ relationships. Ideas of scale are often very different in China; makers – even those planning crowd-funded production runs – are small customers for Shenzhen manufacturers and suppliers. Sometimes we just have different approaches about the role of going to market in scaling impact. So how can small entities such as social innovation organisations or lone hardware hackers work with innovation-led structures like makerspaces (in the ‘group innovation space’ sense), hardware accelerators and corporate open innovation programmes? We need patterns for working together that bridge these different ways of thinking. From state visits (like that by Premier Li to Chaihuo makerspace in 2015) to 5 year plans for industry, the Shenzhen maker scene is heavily influenced by state intervention. In the UK, we’re starting to see interest from government in the potential of ‘everyday entrepreneurs,’ (as the government’s Industrial Strategy green paper (PDF) calls them). This focus on the entrepreneurial side of making seems to lie much closer to the Chinese concept of ‘mass innovation’ than the more amateur or grassroots ideas of maker culture we’re familiar with in the UK. There’s an opportunity here to harness the resources only government can bring, but it also brings the risks of hype overtaking reality, of investment being misplaced, or of new models being forced to fit old ways of thinking about how innovation happens. So what can we learn from our counterparts in Shenzhen, and where should we be careful about trying to lift the Chinese model and replicate it here? What is the relationship between maker culture and the global networks of manufacturing, distribution, knowledge-sharing and marketing? If we want a maker revolution that is more than a crowd-funded surplus of electronic gizmos and 3D printed Yoda heads, how do we design those systems to favour the kind of revolution we do want? Here, maker culture intersects with some planet-sized problems, from the future of work, to the sustainability of a consumer economy. During the Hello Shenzhen exchange it was fascinating to see the differences in approaches to these problems – by no means homogeneous within each country’s participants, but I’m sure informed by their respective national histories of making, from the decline of traditional British industrial institutions over the last 50 years to the desire in China to shift away from the OEM model that has fuelled its recent growth. As each country seeks to reinvent its manufacturing economy, there is much excitement (and some scepticism) about how the maker movement could fuel this new economy, from local manufacturing (PDF), to fulfilling work in a world after automation, to a more sustainable approach to design. If we want to realise these opportunities, we need more robust methods for inspiring, learning from and sharing with each other.